Best of Eleuthera – North Eleuthera Shopping Centre – Burchie’s ! This week I took a trip up to the North Eleuthera Shopping Centre or Burchie’s as it is more commonly known. 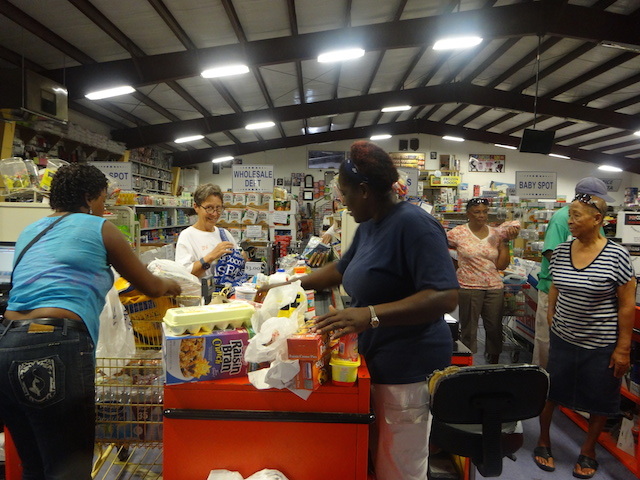 Burchie’s is the closest Eleuthera has to a department store ! It sells groceries, fruit and vegetables, hardware, home goods, appliances, clothing and most other things you can think of. Fresh deliveries come in on a Friday or Saturday so weekends are a good time to visit. They have a great selection of fruit and vegetables – I love mushrooms and bought a pack of large portobello along with the usual white button ones. Snow peas, zucchini, baby plum tomatoes, fresh cilantro, mango, blueberries and blackberries were among the things I bought. The berries are perfect for the smoothies I like to make with local fresh coconut water and local bananas. Household cleaning goods are another thing it is useful for me to stock up on for our rental houses – large sizes, good prices and a great selection made this visit a worthwhile trip…..
Burchinal Gibson along with his lovely wife Sophie own and run the store – they have 19 employees and some of those are family – it is very much a family run business. Contact them on 335 1880 or 225 0964 and ask about delivery of goods to wherever you are on the island !!! Not famous for being large capacity shopping carriers ! After loading up my little Beetle with LOADS of shopping Amanda and I made a stop for lunch at the Laughing Lizard in Gregory Town. I had a fabulous toasted panini with portobello mushroom, caremlised onions and avocado – delicious – and Amanda had a curried tuna wrap. This is always a great stop off for lunch if you are traveling the island – Petagay the chef is a very talented and imaginative woman – it is always hard to choose as the menu looks so good ! Delicious lunch with Amanda Rodrigues…. Last stop in Gregory Town was to the teeny weeny boutique called Cerasee. This was the first time I had been there – thank you Amanda for recommending it and I can tell you it will not be the last. Lots of beautiful things at very reasonable prices. It is owned by the very talented Amy Simmons – daughter of Pam Thompson who I did the blog about – The Island Made gift store – and I will be doing a full blog on Cerasee itself very soon…… I bought this lovely necklace and a set of 3 starfish dishes…..
Then home and where the heck to I put all the stuff I bought at Burchie’s ???? Not the biggest trunk I have known !